Brooks Laich sat at his locker after the Washington Capitals' optional skate Wednesday morning wearing a look of restlessness and frustration. Washington, lugging a three-game losing streak, returned from the All-Star break with a bang only because the celebratory cannon in Columbus discharged four times in a loss to the Blue Jackets. Once again, Laich lamented a lack of execution, which had slowly revealed itself during the Capitals' six-week, 14-1-4 run before overtaking them in four straight losses. So there sat Laich, looking every bit as tired as he claimed, placing emphasis on Washington's game against the Pittsburgh Penguins, who hovered above them in the Metropolitan Division. “In a game we must have, our leaders, our top guys need to be the best tonight and set the tone for everybody else,” Laich said. “That’s where it starts. Top guys pull the rope, they set the tone, everybody else falls in behind." It was a statement that later proved prophetic. Led by their stars and supported by their ancillary parts, the Capitals forcibly broke out of their slump in a 4-0 victory. "Up and down the lineup, I thought we played with a lot of purpose, a lot of order," coach Barry Trotz said. "We had a plan and we worked the plan. That was more of the team that I'm used to seeing." Trotz knew that he could only harp on his team's recent pratfalls so much. He could work to identify the problems, but the onus was on the players to rediscover the consistency and commitment that had spurred them. Washington's 2-0 lead was made possible by Alex Ovechkin, who usurped the NHL's goal-scoring lead with a nifty first-period deflection and a physics-defying one-timer in the second period, which rocketed into the net so fast it was barely perceptible. Braden Holtby recorded his fourth shutout since Dec. 20 and the Capitals blocked 23 shots after allowing 17 non-shootout goals in their past four games, including 14 at even strength. All four forward lines played effectively, inviting Pittsburgh's physicality as melees materialized. "If we keep playing that physical style, with our group, once you get a lead it's hard for other teams to come back because you keep pushing and it kills their mojo," Holtby said. 'That's a lot more how we have to play." Washington's performance Wednesday, unrelenting and complete, encapsulated Trotz's ideal vision of his Capitals, certainly welcomed after a slight deviation. 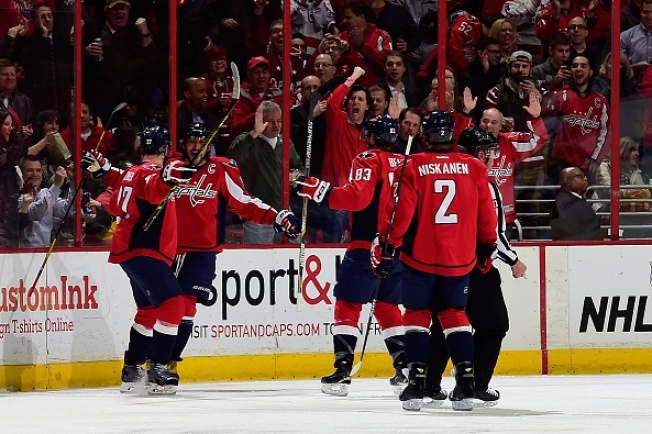 "Right from the start we came out hard and we worked, worked as a team," Nicklas Backstrom said. "We played physical and that paid off."